ATLANTA, Sept. 5, 2018 /Christian Newswire/ -- Care Net, a nonprofit ministry that supports one of the nation's largest network of pregnancy centers, kicked off its 35th annual conference this morning at the Atlanta Marriott Marquis. The conference is the nation's largest yearly gathering of pregnancy center and church leaders. The conference theme, "Each One Reach One," is based on 1 Corinthians 3:6-9 which says, "I planted the seed in your hearts, and Apollos watered it, but it was God who made it grow. It's not important who does the planting, or who does the watering. What's important is that God makes the seed grow. The one who plants and the one who waters work together with the same purpose. And both will be rewarded for their own hard work. For we are both God's workers. And you are God's field. You are God's building." With a new sense of hope in the pro-life movement around the possibility of Roe v. Wade being overturned, it is more important than ever for our nation to be prepared to serve the women and men who will continue to need support around unplanned pregnancies, even after the nation's laws change. The "Each One Reach One" theme also signals a critical shift that must happen within the pro-life movement; the shift from evangelism alone to discipleship and evangelism in unity. Evangelism happens in pregnancy centers; discipleship happens in churches. For pregnancy center clients to be transformed -- rather than simply being helped in a transactional manner -- they need to be connected to local churches for ongoing discipleship after they have a conversion experience at their local pregnancy center. "As the end of Roe v. Wade appears to be in sight, it is more important than ever for us to build bridges between our nation's churches and pregnancy centers," said Roland C. Warren, president and CEO of Care Net. "True pro-life victory requires the Church and its people to provide ongoing life support to women, men, and their children before, during, and after they make decisions about their unplanned, unexpected, and unexpectedly complicated pregnancies." The conference will provide pregnancy centers and churches the training and inspiration they need to continue growing the Pro Abundant Life movement, which Care Net began in order to create a fundamental shift in the approach to abortion. This new movement requires a focus on four key areas: marriage, fatherhood, Christ, and culture change. According to Care Net's "2018 Impact Report," the organization, through its network of 1,100 affiliated pregnancy centers, has saved 677,248 lives in the last ten years. Moreover, Care Net-affiliated pregnancy centers have provided 1,083,772 no-cost ultrasound scans, more than 1 million clients have received parenting support and education, more than 1.6 million people have heard the Gospel, more than 1.6 million people received material resources, and 2.8 million no-cost pregnancy tests were given at the centers in those ten years. These services, provided at no charge to pregnancy center clients, saved communities over $230 million between 2014 and 2017. This data is collected annually from Care Net's affiliated pregnancy centers and Care Net's Pregnancy Decision Line, the only national hotline providing immediate pregnancy decision coaching. This year's conference keynote speakers will enhance the theme of building effective bridges between churches and pregnancy centers. They include Roland C. Warren, Louie Giglio, Chelsea Cameron, Lisa Harper, Jill Savage, Bethany Barr Phillips, and Dr. Tim Elmore. The conference will also help leaders create more effective programming aimed at engaging men and fathers around their roles and responsibilities with parenting and marriage. Five years ago, less than half of Care Net-affiliated pregnancy centers provided fatherhood or men's support. Today, that number has grown to more than 3 out of 5 centers. 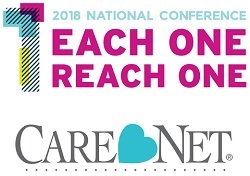 Care Net will also hold the annual NET Talks, in which a variety of speakers will give short, inspirational talks on topics such as leadership, spirituality, and other relevant topics. This year's NET Talks include a panel discussion with Abby Johnson, whose And Then There Were None ministry has rescued hundreds of former abortion clinic workers. There will also be a panel of pregnancy center and church leaders discussing the challenges and opportunities around creating partnerships in their communities. Additionally, Care Net, through its long-standing partnership with Regent University, will award a full-ride tuition scholarship to Mary E. "Lizzie" Burton. Lizzie -- a client of Options Now, a Care Net affiliated-pregnancy center in Valdosta, GA -- will accept her award at the banquet dinner on Friday evening. A variety of other awards will be given to centers for diverse accomplishments in offering the highest level of compassionate care to their clients. The conference begins today and concludes Friday evening with the dinner and awards banquet. A full schedule is listed on Care Net's website. Founded in 1975, Care Net supports one of the largest networks of pregnancy centers in North America and runs the nation's only real-time call center providing pregnancy decision coaching. Acknowledging that every human life begins at conception and is worthy of protection, Care Net offers compassion, hope, and help to anyone considering abortion by presenting them with realistic alternatives and Christ-centered support through its life-affirming network of pregnancy centers, churches, organizations, and individuals. Learn more at care-net.org.